Do you know what happens when you live in New York and you type the words “why am” into Google? Do you know what happens when you live in New York and you type the words “why am” into Google? Before you can type the next word, Google’s Autocomplete function helpfully offers to complete your thought. 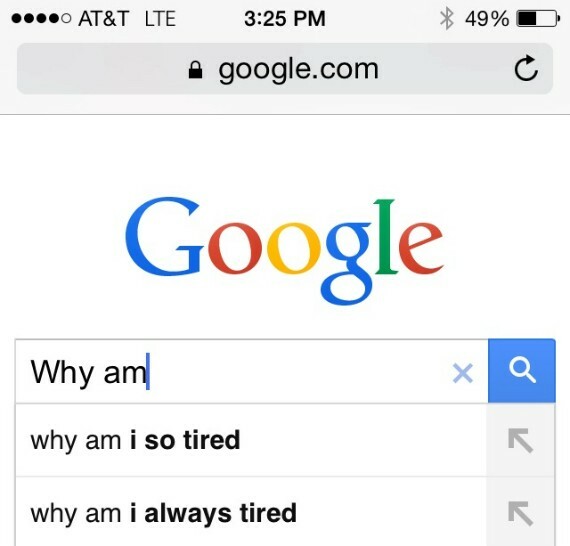 The first suggestion: “why am I so tired?” The second: “why am I always tired?” The Zeitgeist perfectly captured by Google. Google has become something of the secular equivalent of a confessional box. Within the confines of a search bar you can ask questions or express opinions you would never admit to in public. Our most popular searches are, to some degree, an uncensored chronicle of what, as a society, we’re thinking but not necessarily saying. Hillary Clinton, as my simple, half-completed Google search suggests, is not alone in wanting to know whether we can get untired. A few minutes spent typing random words (or celebrity names) into your Google search bar confirm this. But in the case of our tired civilization, there’s nothing silly, strange or particularly surprising. Actually, the thought of so many people hunched over their laptops or iPhones, asking Google, “Why am I so tired?” or “Why am I always tired?” is really sad. And the answer is not going to be given to us by an algorithm. But we can start by shutting off our devices and getting some sleep. Please let me know what happens when you Google “why am” in your area of the country or the world.